R & R General Contractors, Inc. uses Excel Modular Scaffold Systems for flexible and rapid interior and exterior construction purposes. You can rely on our structures for strength, safety and durability. The Excel Modular Scaffold System is the most innovative development introduced to the scaffold industry in the past twenty years. With Excel’s “positive locking”, “no tools” assembly features our customers have documented labor savings of 30% to 50%. Excel will eliminate 75% of the tube and clamp used on projects drastically reducing the need for tools. There are no tools needed to erect Excel which allows builders to keep both hands on their work making them less likely to drop scaffold components or tools. The Excel system surpasses our competition by allowing scaffold builders to tie off on properly erected scaffolds and eliminating many of the inherent risks of scaffold construction. According to statistics on the OSHA website an average of 88 scaffold related fatalities occurred between 2000 and 2004. I am sure you can see how being able to tie off to the scaffold, reducing the use of components and tools that can be dropped, while reducing exposure time will make your jobs much safer. The DuPont Corporation produced a video to demonstrate our “Excel Scaffold” as their most innovative product of the year and sent it out to their plants worldwide. Please visit the Excel web-page and click on the video icon to see for yourself the 30% increase in scaffold productivity that DuPont experienced. 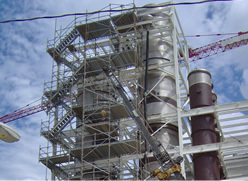 The Excel Modular Scaffolding System sets us apart in the extremely competitive refinery, utility markets. 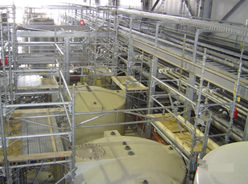 R & R General Contractors, Inc. has experienced increased safety and productivity with our scaffold crews wherever we perform work and this has translated to huge savings for the ultimate owners on critical path projects by helping them to re-start their units ahead of schedule. Excel has proven time and time again to outperform the competition because of it's design. No tools required with positive locking trigger. 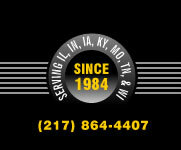 Consistent labor savings up to 30%. Less Exposure time. Less likely to drop tools or components. Cups every 5.75” rather than the standard of 18” with every other modular system. Eliminates most tube & clamp modifications and makes deck height adjustments simple and quick. Excel leg loads support 9,000 lb per leg. Other systems support only 5,000 lbs. This results in increased stability and supports more material. This system reduces the man-hours used to organize and inventory materials while also reducing storage area requirements. “Qualified Anchorage” point for Body Harness “Tie-Off” . Greatly reduces fall hazards by allowing workers to tie off to the scaffold. 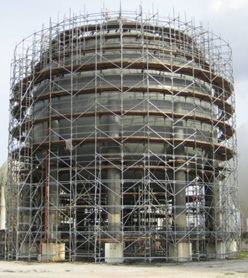 We can construct the perfect Excel Modular Scaffold System® for your needs, contact R & R General Contractors, Inc. today!